Beside Mariebjerg Churchyard in Lyngby, north of Copenhagen, is Fritz Schlegel's chapel of rest crematorium. 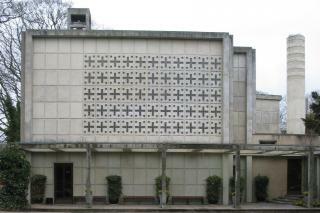 Opened in 1937, the crematorium is an example of modernistic architecture, with death as its central theme. The building has slightly staggered cubic elements and an exposed reinforced concrete structure. Light enters the chapel of rest through the square cross-shaped windows in the facade, producing a beautiful effect. The crematorium serves the 25-hectare Mariebjerg Churchyard, among others, built by landscape architect Gudmund Nyeland Brandt in 1925-1936. The churchyard is composed strictly of squares and rectangles, but the many smaller grave areas have individual styles including all kinds of natural features from forests to grassy verges. In 1881, an association was formed by a number of prominent reformers. Foreningen for Ligbrænding was to promote cremation. As more people were moving to the cities, the churchyards were filling up. The founders were also worried about bodies spreading disease during epidemics. However, at that time, cremation was seen as an unchristian practice. The first private crematorium was built in Frederiksberg in 1886, but was not allowed to cremated bodies until 1893. New technology and the need to save space otherwise used for burials made cremation the modern choice, especially as it also improved hygiene and rationalisation. However, cremation was not to become common for many years to come. In 1937, only 9.6 percent of deceased Danes were cremated. Today, most people choose cremation.